The 1976 3 band stereo saturation and width processor has been designed to inject character, colour & life into your recordings and live sound in a style endemic of the classic equipment of the 1970's. 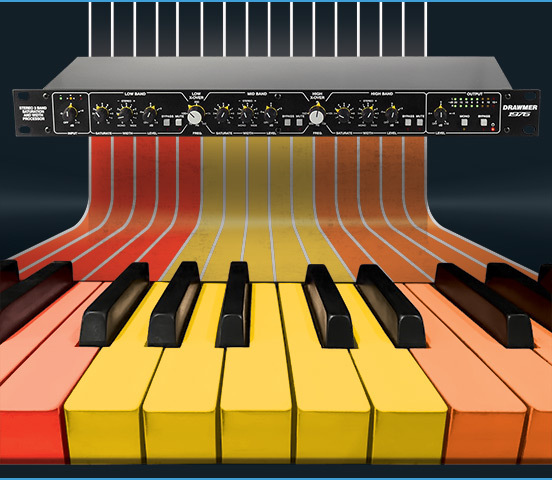 The completely analogue saturation of the 1976 will provide the realism that plug-ins can only aspire to, replacing the harsh, sterile digital sound with fullness, softness and warmth. Why emulate saturation when you can have the real thing? Inspired by the highly acclaimed saturation and width features of our DC2476 Digital Mastering Processor the 3 bands of independent saturation of the 1976 have been designed to add the pleasing imperfections that are so endemic in classic gear. Saturation is ideal for adding fullness to your music, taking your music from a cold, bleak landscape to a warm, bright vista. In addition, however, unlike conventional saturation products the 1976 also features 3 bands of stereo width control to really bring out the depth and add real presence to your mix, and all with a single, yet comprehensive set of controls that provide genuine stereo operation. What is saturation? Saturation in music production is something that can really enrich the sound in your mix by adding a subtle form of distortion that adds pleasant-sounding harmonics. It originates from the analog days when audio recordings ran through various pieces of hardware, each one adding their own character to the music giving the audio a pleasant quality that was much sought after. Today, in the digital age, these characteristics no longer occur naturally, giving an overly clean, sterile quality to the audio, with saturation plug-ins used to emulate those not present. The 1976 allows you to add this character in a completely analogue, natural way. However, it's use is not only limited to digital recordings, it'll add presence, warmth and life to any audio regardless of how it's recorded, whether its drum, vocals, synths and more, in digital or analogue. What about 3 Band Saturation? Because the 1976 as 3 bands of independent saturation it can pull off amazing feats that single-band saturation could never accomplish. For example, it can bring out the bassline, adding presence and grit without ruining the overall balance within the mix by adding distortion to the top end. Or enhance the vocals without making the bottom sound muddy. Where to make the most of Saturation. Drums are one of the best sounds in which to use saturation. It can be used to 'glue' the whole drum bus together, injecting some punch and excitement, giving them depth and life, and adding harmonics that are pleasing to the ear, whilst taming rogue transients and high end harshness using natural compression. Here is an example of a drum loop using the 1976 to enhance the audio. The 1976 is at first in bypass, then active, bypass, active. If your bassline sounds a little flat and lifeless it will really benefit from a adding some saturation. This will bring out the grit, dirty the sound and fatten it out. And we're not just talking about bass guitar here, use it on sine generated basslines to make them sound more natural, and push them out into the mix. Synths tend to sound too digital and clinical. Saturation will bring them to life, making them sound warmer, more natural, and closer to the analogue sound that they emulate. It'll inject harmonics and grit, and make the synths stand out more in the mix. Saturation is one of the secrets to great sounding vocals. Your vocal recordings may sound good but saturation will make them sing (pun intended). It will make any vocal sound fuller, especially thin and dull voices, and will warm and tame harsh sounding vocals by subtly softening sibilance. Don't go over the top though, keep the harmonic distortion gentle or it could ruin the vocals all together. For all of it's pros, digital recording has a major drawback, by it's very nature it sounds too, well, digital. It's too harsh, too clean. Saturation can be the key here. It will add harmonic distortion to inject life and warmth into the mix, and help your digital mixes sound more like those from the analogue recording era. Just passing the audio through an analogue device will have some effect on warming the mix, though passing it through the 1976 will take your mixes to the next level. What about Width? Without stereo widening the mix won't jump out of the speaker and grab your listener, this is where the 3 bands of the 1976 can be used to enhance the extra dimension to take the mix from a flat wall of sound to a 3D immersive experience. It's likely your mix will have a stereo element already, however, the 1976 makes it super easy to control these, widening and monogising where necessary to get the desired effect, and all just using the single stereo controls of the low, mid and high bands. One major benefit of having independent width control for each of the bands is to allow the high frequencies to be spread across a wider soundstage without affecting the low frequency end. Easy! Powerful 3 Band all Analogue Saturation for adding warmth to both your digital and analogue sounds. Designed to Inject character to your audio reminiscent of 1970's era gear and remove the sanitized harshness that digital recordings suffer from. 3 band fully adjustable Stereo Width provides controllable depth and presence to you mix. Fully Variable Crossover controls between the bands allows you to tune in to signals for different amounts of independent saturation across the full frequency range. Genuine stereo operation with one set of controls for both channels. Can operate in Stereo and Mono. The Mono switch helps highlight problems within the stereo mix. Classic Drawmer Build Quality with Rugged Steel Chassis and Alluminium Front Panel. The layout of the 1976 has been designed to be as simple, familiar and intuitive as possible whilst still giving complete control over the audio. The front panel consists of an Input control that allows you to optimise the input level should it be to low, or hot. This is followed by three identical Low, Mid and High Saturation and Width bands, flowing left to right, with the Variable Crossover Frequency knobs separating them. To the right are the Output controls to optimise the output level.